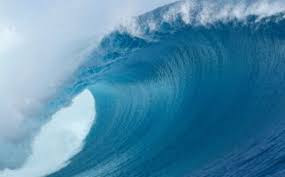 I’ve been working with a young dreamer who dreamt of being pummeled by a tsunami. Once the turbulence subsided, he discovered that he was enjoying the experience—even breathing underwater. Yesterday we restated his dream metaphorically, and it implied that he had survived a major inner change and was both content and enthusiastic about his “new self.” (Scroll down to read our discussion.) But I neglected to ask him about two of the most important symbols in his dream. Today we’ll correct that oversight. David: I didn’t ask you about a couple of the most important symbols. The first one is “ocean.” Tell me about ocean. Dreamer: The ocean is vast. It’s incredibly powerful. We think that, with a little bit of gained skill, we can master it. That’s a joke. If it wanted to, at any moment it could do us in. But the ocean is also really soothing. Just standing on the shore and listening to it brings amazing peace of mind. It’s like the ocean is supernatural. It seems to be more than just a gigantic body of water. Dreamer: Well, you have to breathe to stay alive. Without air you die. And for a while, that’s what I was afraid of in my dream. I was underwater and didn’t think I could breathe. But I finally had to try, and it was easy. David: So earlier, we saw that your dream was all about a big change that you experienced. Now we can add to our understanding: This change was caused by some part of you that is powerful, potentially deadly, but also soothing. It brings peace and it seems to be supernatural—as if it has a consciousness and life of its own. It seems to be much more than the sum of its parts. Am I saying this right? Dreamer: You’re nailing it. That’s exactly right. David: And your fear was that somehow you wouldn’t be able to “stay alive.” But you discovered that it was no problem. David: So what do you think this huge, powerful part of yourself is? It seems somehow to have its own life and its own agenda, and it’s completely taken you over—without harm. Dreamer: I think it might be about a new way of thinking. Dreamer: All through school I was good at sports, especially basketball. But it was all about me, and how good I could be and how popular I was. But after school, as a summer job, I started working with kids in a really bad part of town. It was the first time I’d ever seen anything like that up close. Mom’s on crack; Dad’s in jail. And these kids have nothing. Nobody. Well, I come waltzing in there kind of high on myself, and these little kids—boys and girls—are all over me, just because I give them a little bit of affection. It changed my whole life. I mean, they need me—or someone like me. That’s a whole new experience for me. David: And at first you weren’t sure if it was going to let you “breathe,” but now you are thriving?